Capezio Leather Flats. Lovely shade of green. Capezio "Robin" Black Leather Slip On Horse Bit Loafer Shoes Made in Brazil Size 6M. 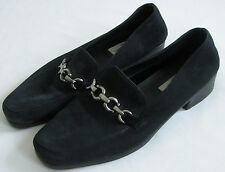 Capezio Lites comfort loafers in black suede leather accented with a silver chain link. Diamond flex soles, padded insoles. In excellent pre-owned condition, minimal wear. 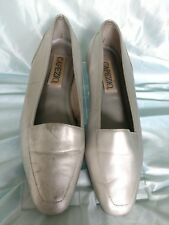 Capezio created these Size 8.5M "Smoking Flats" silver slip-on leather low-heeled shoes. They are made in Brazil, famous for their fine leather shoes. The silver finish is scratched and tarnished from wear, so I offer them as a final sale. Expect them to be scuffed, especially the right shoe, but comfortable. I acquired them because of respect for the Capezio brand and that they were made in Brazil. NOTE: Shoes need throughout cleaning and leather conditioning. Beautiful pair of shoes that you will love to wear. These are in wonderful condition. Heel: 1/2". Material Leather. Color Silver. Size: 8.5W. Good used condition. Capezio ‘Becky’ loafers. --Ivory leather upper with everted moccasin-style stitching around vamp. --Nonslip treaded rubber sole and heelcap. Size: 7 Narrow. Material: Leather upper, balance: man-made. Color: Red. I try to take the best pictures that I can. Great comfort shoe, has stretch elastic over top for good fit, soft inside, Capezio Lites, 7 wide. Excellent condition. Flat loafer shoes. Flat loafer style. New without box. Excellent condition. 10 1/4" LONG ON BOTTOM SOLE, 3 1/8" WIDEST POINT ON SOLE. Capezio Leather Slip-on Loafers/Flats. These are great leather loafers with a nice thick rubber sole. NOTE to consider. Very nice leather shoes with a comfortable rubber sole. Slip On Flats. Made In Brazil. Gold Leather.